(Photo: Pete Souza / Flickr)Washington – Sometime Friday, the federal government will take the first step toward cutting spending in dozens of departments and programs after the two major parties each tried and failed to muscle partisan alternatives through the Senate. With the last-minute effort to avert the automatic spending cuts failed, the House of Representatives adjourned, the Senate wrapped up its scheduled business for the week, and most members went home. “Tomorrow I will bring together leaders from both parties to discuss a path forward,” Obama said after the congressional votes failed. With Congress gone, even a last-minute breakthrough agreement that no one expects likely would come too late to stop the first moves to start cutting $85 billion from this year’s $3.5 trillion budget. Sometime before midnight – the 2011 law requiring the cuts stipulated only that they start going into effect on March 1 – Obama is expected to sign a directive ordering the White House Office of Management and Budget to start putting the cuts into effect. With much of the federal budget such as Social Security off limits, the cuts will be concentrated on a smaller part of the government, split evenly between defense and non-defense programs. Many will take weeks or even months to go into effect. The 2011 law set the automatic cuts to force Congress and Obama to come up with a more palatable alternative to curb deficits by $1.2 trillion over 10 years. But Democrats insisted insisted on adding tax increases and smaller spending cuts. Republicans insisted that it all be done with spending cuts. And that’s where they ended up again Thursday in the Senate. Democrats proposed curbing projected deficits with a minimum 30 percent tax on millionaires, the closing of tax loopholes, and spending cuts to military and farm programs. Republicans proposed keeping the same amount of spending cuts but giving Obama flexibility in how the cuts are implemented. The Republican bill fell far short of the 60-vote threshold on a procedural vote and was defeated with 38 senators for and 62 against. Nine Republicans – McCain and Sens. Lindsey Graham of South Carolina, Marco Rubio of Florida, Rand Paul of Kentucky, Kelly Ayote of New Hampshire, Susan Collins of Maine, Ted Cruz of Texas, Dean Heller of Nevada and Mike Lee of Utah– voted against the measure. Two Democratic senators, Mark Warner of Virginia and Max Baucus of Montana, voted for the Republican bill. The Democratic measure failed 51-49. Democratic Sens. Kay Hagan of North Carolina, Mary Landrieu of Louisiana, Mark Pryor of Arkansas and Senate Majority Leader Harry Reid of Nevada voted with Republicans against the bill. Both sides seemed publicly cemented in their positions Thursday. Obama hopes “that Republicans, whether it’s the short term or the long term, are ready to talk seriously about compromise and making sure that Washington is not inflicting wounds on the economy right when the economy should be growing and creating jobs,” Carney said. 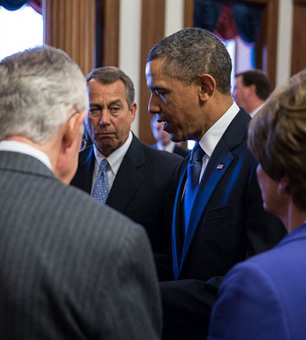 Boehner and McConnell didn’t sound like they were in compromising moods Thursday. Even before Thursday’s votes and Friday’s meeting, congressional Democrats and Republicans were looking ahead, suggesting that the cuts could be restored, or at least reconsidered, in budget fights to come. That’s likely to come over the next three weeks when government funding expires March 27, requiring new budget legislation called a continuing resolution.